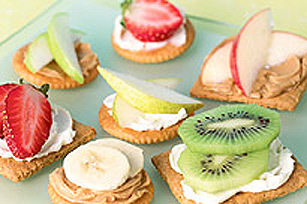 Whip up a simple snack of cream cheese and your favourite fruit on graham wafers. These Open-Face Fruit Snacks are fast, fresh and tasty. Spread 1 Tbsp. Philadelphia Cream Cheese or Kraft Peanut Butter on Honey Maid Graham Wafers or Ritz Crackers. Top with sliced bananas, kiwis, pears, apples or berries.